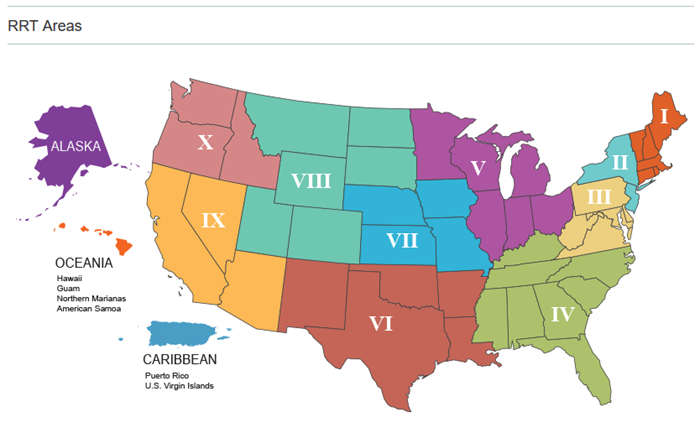 There are 13 Regional Response Teams (RRTs) in the U.S., each representing a particular geographic region (including Alaska, the Caribbean, and the Pacific Basin). RRTs are composed of representatives from field offices of the federal agencies that make up the National Response Team (NRT), as well as state representatives. The four major responsibilities of RRTs are: response, planning, training, and coordination. Response: RRTs provide a forum for federal agency field offices and state agencies to exchange information about their abilities to respond to On-Scene Coordinator's (OSC's) requests for assistance. As with the NRT, RRT members do not respond directly to releases or spills, but may be called upon to provide technical advice, equipment, or manpower to assist with a response. Planning: Each RRT develops a Regional Contingency Plan (RCP) to ensure that the roles of federal and state agencies during an actual incident are clear. Following an incident, the RRT reviews the OSC's reports to identify problems with the Region's response to the incident and improves the plan as necessary. Training: Federal agencies that are members of the RRTs provide simulation exercises of the RCP or Area Contingency Plan (ACP) that each RRT maintains. These exercises test the ability of federal, state, and local agencies to coordinate their emergency response activities. Any major problems identified as a result of these exercises may be addressed and changed in the RCP so the same problems do not arise during an actual incident. Coordination: The RRTs identify available resources from each federal agency and state within their regions. Such resources include equipment, guidance, training, and technical expertise for dealing with chemical releases or oil spills. When there are too few resources in a region, the RRT can request assistance from federal or state authorities to ensure that sufficient resources will be available during an incident. This coordination by the RRTs assures that resources are used as wisely as possible, and that no region is lacking what it needs to protect human health and the environment. The following map shows the Regional Response Team (RRT) regions. The table below lists the NOAA primary and alternate representatives for each RRT region and their contact information. Questions: Contact us with your questions, comments, or suggestions about NOAA's role in Regional Response Teams.